Card counting systems are used by hundreds of professional players worldwide as they have proven to be extremely efficient and accurate. Nowadays there are many available strategies which give gamblers the valuable opportunity to choose the one that suits them best. A great number of systems have the fundamental principle of assigning point values to the cards but their plans vary in level of difficulty and efficiency. Even though most of them are used only by advanced players due to their complexity, there are some basic systems which have been especially designed to allow even beginners to be able to take advantage of them. The Hi-Opt systems (Highly Optimum) are card counting methods which are famous for their high level of efficiency and accuracy. Initially, Hi-Opt I was founded and later on, upgraded which resulted in the creation of Hi-Opt II. Even though both systems are considered to be moderately advanced, their level of count is different and it’s recommended for players who are willing to learn them to take their time to consider their similarities and differences. The Hi-Opt I card counting system was established in 1968 by Charles Einstein and this is the reason why this method is often referred to as the Einstein Count. The author’s biggest inspiration was the book Beat The Dealer by Edward Thorp as thanks to it, he managed to create the Hi-Opt I. 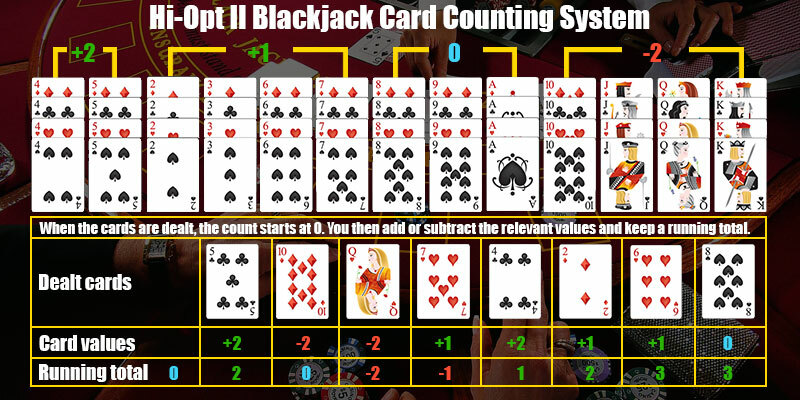 This system is a very popular method in Blackjack as it provides a high level of accuracy and efficiency throughout the course of the game. The Hi-Opt II card counting system was developed by Lance Humble, not long after the initial system was created. It’s basically an improved version of the Hi-Opt I as it uses its foundation and main principles. Even though it does provide better accuracy and higher chances of gaining an advantage over the casino, it is much more difficult to be learned. Players should bear in mind that this system is only efficient if applied correctly and in order to do that, they need to be extremely focused and disciplined. The main difference between both systems lies in their assigned point value of the cards as the way they are counted plays a crucial role for the players’ performance on the table. It determines whether one strategy will be efficient or not at predicting the upcoming cards and therefore, giving gamblers the needed advantage. As the Hi-Opt II is the updated version, understandably it is more advanced and accurate than Hi-Opt I. However, it is much more complicated and hard to be understood which is not beneficial for the players. This factor shouldn’t be underestimated in any case because if they won’t be able to apply it correctly throughout the course of the game, its accuracy and efficiency won’t be high enough to help them achieve the desired results. Another difference is their level of count as the Hi-Opt I is level one and the Hi-Opt II – level two. In most cases, when one system is improved its level of count increases as well due to the fact that it becomes more complicated and advanced. Hi-Opt I includes only three assigned point values for the cards – minus and plus one and zero. Whereas its updated version has new values added – plus and minus two which makes following the cards on the table more difficult. The main similarity between these two systems is that they are both balanced ones, meaning that if players count an entire deck from the beginning till the end, when they finish the count should be equal to zero. This is good news for them as balanced systems are considered to be easier to use and apply. Another thing worth mentioning similarity is that both strategies aim at providing players with better chances of gaining an advantage over the casino and win. Their creators’ first priority was to develop a strategy which will be effective and accurate like no other card counting method. Even though Hi-Opt I has an improved version of it, many players still continue using this system as it’s plan has proven to be easier to be comprehended. The assigned point values for it are as follow: the cards from three through six get plus one value, all of the face cards and ten get minus one and the rest of the cards are counted as zero. Seemingly, this strategy resembles the Hi-Lo system as the only cards that are counted differently are the ace and the two. As already mentioned, the improvement of the initial system resulted in the creation of Hi-Opt II system which is much more accurate but also much more complicated. The assigned point values in this system are as follows: the cards two, three, six and seven get plus one, four and five get plus two, eight, nine and ace are counted as zero and the rest of the cards are worth minus two. It is observable that this plan is much more difficult to remember as there are more than three assigned values. Players need to bear in mind that most casinos are full of distractions and it is really hard to concentrate and recall difficult strategies. However, if they manage to do so, they will surely have a huge edge over the casino and be able to adjust their bets accordingly. The bottom line is that the Hi-Opt systems are both very accurate and efficient for experienced players who have solid knowledge of the basic card counting systems. The Hi-Opt I is similar to the Hi-Lo system which makes it suitable for not so advanced players. Whereas the Hi-Opt II is very complicated and in order to be applied correctly, they need to invest a lot of time in it. However, once comprehended and understood, it provides them with the incredible opportunity to increase their chances of winning by adjusting their bets and basic strategy accordingly. Moreover, if players want to take advantage of these systems, they need to make sure that they are disciplined enough and will be able to focus in a casino setting which in most cases is full of noises and other distractions.